I have been hanging our clothes on our little IKEA hanging rack off and on for the last year. I bought a second rack this summer, because one just wasn’t enough for us, and I am so glad I did. 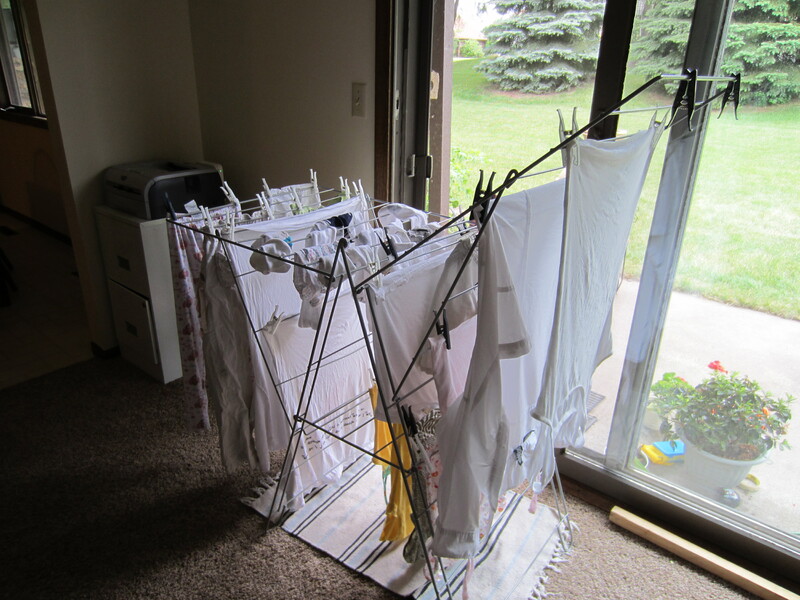 Since we decided to go gung-ho on our debt, I have been hanging almost all our laundry. I even hung our towels this summer, which made them a little crunchy. Now that the hot summer sun is going away, they don’t dry fast enough and just end up a little musty smelling. So, they go in the dryer. I do plan on hanging the rest of the clothes year round. Not only am I saving money by not using the dryer, I am also lengthening the life of our clothes by not exposing them to so much heat. It is a little extra work, but I can handle it for now. I am glad to know there is always the dryer, if I ever need an extra hand with the laundry. By the way, we have payed off TWO of our six school loans since the beginning of September. Feels good. Do you hang your laundry? Here in Zambia I do. I have only used a dryer 3 times maybe in the last 5 months. I was wondering how to hang dry in the cold…guess you do it inside. Way to go P and J! My grandma did it outside and yes, she lived in Minnesnowta!